The Commonwealth’s budget has a Keynesian boost for a sluggish economy, and is based on an optimistic, or even heroic, assumption that economic growth will deliver a fiscal surplus within a few years. We have heard similar claims from treasurers, Labor and Coalition, ever since 2009. The Government’s other claim is that it is “fair” – a claim that holds up only if one ignores its effect on young people. The media is saturated with budget coverage, mainly of the form “what’s in it for me”. I want to draw attention to four aspects which have had comparatively little attention. As with previous budgets, this one claims to show a path back to a fiscal balance – a small surplus by 2020-21. While the immediate forecasts are for a cash deficit, mainly associated with infrastructure spending, the projections are for a strong recovery in taxation receipts – both corporate and individual taxes. The recent history of taxation forecasts is shown below. 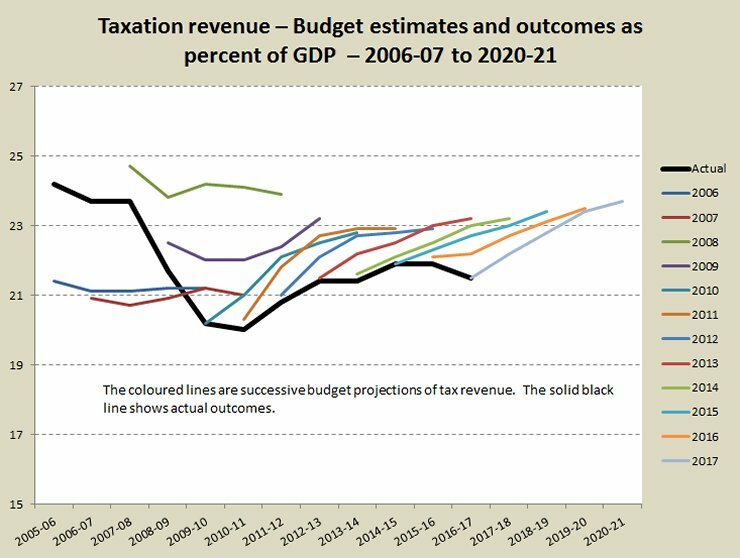 The coloured lines show successive budget projections while the solid black line shows the outcome. Morrison’s line is the pale blue one at the end. There will be a small boost to revenue as the higher Medicare levy and the major bank levy kick in, but these come to only $6 billion by the end of the four-year forecast period. The big gain in taxation revenue – an extra $110 billion a year by 2020-21 – is supposed to come from economic growth. Even though unemployment is projected to stay above five percent, wages are expected to rise, and already heavily-indebted households are expected to go further into debt to finance consumption. If our post-2008 weak economic performance is an unusually-prolonged cyclical downturn, Morrison’s big Keynesian boost might do the trick. If our poor performance results from structural weaknesses in our economy – a deficit in skills, distorted taxation incentives, a lack of a plan to decarbonise the economy, inadequate transport and internet infrastructure – it’s doubtful that revenue will recover. And that’s all assuming no shocks to the economy. Although the budget papers contain sections on sensitivities and risks, they model only minor (ten per cent) possible falls in commodity prices, and they make no mention of the possibility of a bursting housing bubble or a spike of natural disasters associated with climate change. The two big ticket infrastructure items – Sydney’s second airport and the inland rail – are really both commercial ventures. Because they will return revenues once completed they could conceivably be financed by the private sector, with some public subsidy to cover what economists know as “positive externalities” – benefits that are not captured by the private investors. In terms of what is generally known as “public good” infrastructure – that is infrastructure where the returns accrue to the community rather than to the investor and which the private sector will not provide – there is not much in the budget. To quote Adam Smith, public good infrastructure involves “public works, which, though they may be in the highest degree advantageous to a great society, are, however, of such a nature that the profit could never repay the expense to any individual or small number of individuals”. There is $840 million for the deadly and congested Bruce Highway, but otherwise there is little public good infrastructure in the budget, and infrastructure payments to the states are actually projected to fall significantly – for example general road funding will fall from $4 billion to $2 billion over the budget period. The Commonwealth’s splurge on infrastructure is about two concerns. One is to do with the cosmetics of public accounting. It is to ensure that at least the big assets (the airport and the inland rail) stay on the Commonwealth’s balance sheet, because the general practice for infrastructure, particularly public good infrastructure, has been for the Commonwealth to record it as an expense and for the asset to appear on states’ balance sheets. These assets will be on the Commonwealth’s balance sheet. The other is to step in where the private sector hasn’t. One may have thought the Macquarie Group would have leapt at the opportunity to own both Sydney airports, but no doubt they see more lucrative prospects elsewhere. And the inland rail may not be a great idea by any criterion: with a benefit-cost ratio of only 1.1 it barely passes muster on Infrastructure Australia’s priorities. Record low interest rates have not enticed the private sector to invest. Over 200 years Australian investors have become conditioned to expect high investment returns through exploiting new mineral resources, speculating in land, and engaging in lobbying and other rent-seeking activities. Projects such as airports and railroads, which may appear attractive to investors in other countries where there are more realistic expectations about future returns, are of no interest to our private sector. While a Keynesian boost may be useful fiscally, these projects are not the right sort of infrastructure for a government to fund, and their choice exposes a major problem in our financial markets – either a lack of confidence or unrealistic profit expectations. Perhaps both. Although the tax applies to bank liabilities (deposits) and should in theory encourage lending, it is likely that the banks will recover some of their lost revenue through higher interest charges. The pain will be felt by heavily-indebted investors, including those with high exposure to investment houses. When interest rates rise it will be the fault of the unloved banks, not the government. I’m no apologist for the banks: their behaviour in recent years has been terrible. But this is bad policy because it directly contradicts prudential measurers designed to make our financial sector more secure. And it’s capricious: along with energy policy it sends the message that the government has no sound and rigorous mechanism to develop economic policy. The scheme to allow people to divert superannuation to a house deposit may be superficially attractive but it’s a confidence trick. To enjoy any benefit a young couple would have to be reasonably well-off. How many people at the stage of their lives when they’re looking for housing can afford salary sacrifice? The budget propaganda promoting the scheme models a young couple with a combined income of $120 000, who would therefore be in the top 40 percent of household income. More basically, even if people do take it up, all it would do is to drive up demand in an already overheated and supply-constrained market. It’s a small leg-up for people competing in a market where the government is already giving privileged investors a whole-body lift. And for a young person who takes $30 000 out of their superannuation, the accumulation forgone by the time of retirement would be between $130 000 and $200 000. The government’s failure to do anything significant on housing affordability is just one area where public policy is letting down young people. The budget also proposes to increase the burden of student debt, a cruel and economically irresponsible measure because it would simply shift debt from the government to households – young households. But our national debt problem isn’t government debt (as Morrison mow reassures us); it’s household debt. Similarly, so long as our government avoids establishing a sound policy on climate change we are loading the eventual costs that will have to be borne on to people who are now young. Government policy on private health insurance is designed to transfer income from younger to older people, and in spite of some minor reforms in last year’s budget the cost of superannuation concessions for retirees continues to rise: by 2020-21 concessional treatment of superannuation fund earnings will be costing $27 billion a year. That could buy a lot of TAFE places, a lot of university places, and a lot of places in drug rehabilitation for unemployed young people who have turned to substance abuse. This entry was posted in Economy, Housing, Infrastructure and tagged budget, economy, housing, Ian McAuley, infrastructure, politics, superannuation, tax. Bookmark the permalink. And now there is a letter to-day from Mark Scott Head of the NSW Dept of Education to 2000 public school principals alerting them to the lies from Trumble and Birmingham – that huge cuts will be made to state schools – not the increases they have been spruiking! Something like $1.8 billion in actual reduction! It appears Trumble and his Finance Minister and Treasurer have all taken Fake News lessons from the US master – Trump! So even the bits of the budget that appeared to be at least slightly positive and are now proving to be merely sleight-of-hand – may well hold warnings for the rest of this budget! This LNP is not to be trusted! Very useful synthesis and commentary. It surprised me that there wasn’t more public infrastructure investment, funded by ScoMo’s ‘good debt’. Why not? And why is Turnbull deliberately losing points in Victoria? Lots of available projects, and the most progressive electorate – which won’t love him just because the State government he’s frustrating is Labor.